With immediate effect, Bareface has dropped the Media appendage to become simply Bareface. In order to move forward, creative companies need a clear sense of purpose. No identity crisis here, Bareface is an advertising agency. Albeit a very modern iteration. “We now have absolute clarity on what Bareface is. Our positioning statement, Advertising+Data+Art+Science, suggests the modern advertising agency is a collision of all these things. Which Bareface absolutely is." Technology binds together everything we do but everything we do, regardless of output, begins with advertising sensibility at its core. The power of the idea. The advertising landscape is increasingly complex and ever-changing. More customer touchpoints than ever before, from the traditional to the emerging, and that expansion shows no sign of letting up. Bareface strategically blends these channels to connect people to products and services, achieving the brand clarity, consistency and authenticity that turns consumers into customers. Our clients’ performance is our only metric. 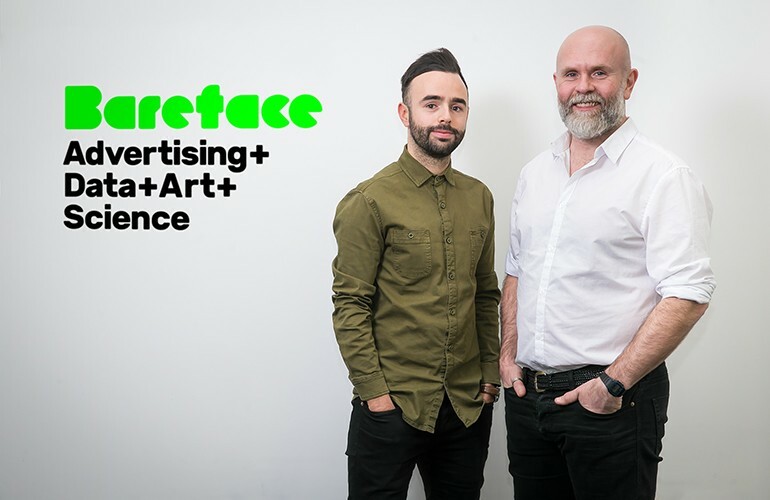 Pictured (L-R): Anthony Looney, Creative Director and Steve Price, Chief Creative Officer with the new Bareface brand.